(Bloomberg) -- Donald Trump is being left out of his attorney general’s deliberations over how much to release publicly from Robert Mueller’s investigation -- including matters the president could say he has the authority to keep private. Attorney General William Barr hasn’t discussed any part of Mueller’s report with the White House, according to a Justice Department official, but plans to rely instead on his own judgment in deciding whether some details in the report should be withheld under executive privilege. 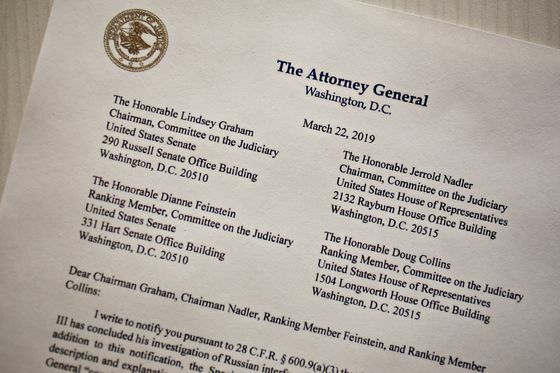 A Justice Department official declined to say whether Barr is planning to redact material in the report that he deems sensitive regarding presidential deliberations. If he does, it’s unclear how narrowly or broadly Barr will interpret the question of executive privilege -- whether he will take it upon himself to protect Trump’s privilege and hold back a broad set of details, or err on the side of full disclosure. Either way, Barr has put himself in an almost unprecedented situation for an attorney general by taking a path different from the one that Trump’s lawyers initially anticipated. Before Mueller submitted his report to Barr, there was an assumption that the attorney general would let the White House review information that would fall under executive privilege -- a doctrine cited by other presidents who said it was needed to ensure they get confidential and candid advice from their advisers. In the past, the determination over what internal information can be made public has rested solely with the president, with the courts judging any challenges. Even so, Trump’s personal lawyer Rudy Giuliani said Tuesday that he’d be fine with the full report being made public. 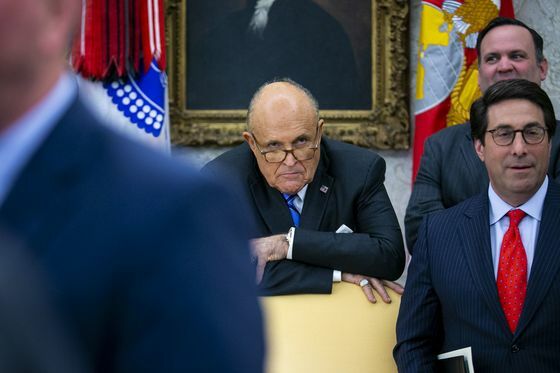 The lawyers are prepared to defend any details unfavorable to Trump, and they’ve spent months putting together a rebuttal to Mueller’s report based on the legal team’s understanding of the events Mueller was investigating. During the Mueller investigation, White House lawyers agreed to hand over thousands of pages of documents and allowed interviews with dozens of White House aides, but they said they were reserving the right to invoke executive privilege to prevent details from being released to Congress and the public. The review of Mueller’s findings represents the first major test of Barr’s independence, as well as of the Justice Department’s regulations governing special counsels, said a U.S. official with knowledge of the process who asked to remain anonymous. Barr has said he plans to redact information related to grand jury testimony, which is secret unless released by a judge, as well as classified information that could compromise intelligence-gathering sources and methods. He’s been less clear on what he would leave out concerning Trump’s time in the White House, but the attorney general cited the president’s own words to explain his approach. If Barr takes those comments literally, it could mean he won’t redact any information from the report about private White House conversations or memos unless told otherwise. Barr, who in the past has taken an expansive view on presidential power, could also choose to take out all information that could be considered privileged and leave up to Trump whether he wants to lift the redactions after the report is public. In the summary Barr released last month, he said that Mueller didn’t establish that Trump or anyone associated with his campaign conspired or coordinated with Russia. Nonetheless, Barr said that he and Deputy Attorney General Rod Rosenstein reached their own conclusion that there wasn’t sufficient evidence to establish that Trump committed a crime. Mueller was never given a directive to create a report that could be made public, and there’s no such requirement under the guidelines creating his position as a special counsel, according to the U.S. official. This will be the first real test of how the special counsel regulations work. They were put in place in 1999 in response to criticism over Independent Counsel Ken Starr’s Whitewater investigation and the graphic details in his public report. That leaves Barr operating without a precedent.